Cough Assist T70 New - SHIPS FREE! Cough Assist T70 *Opened Box w/ Full Warranty* - SHIPS FREE! This product is subject to a 3-5 day lead time before shipping. Respironics Cough Assist T70 helps with the removal of bronchial secretions. 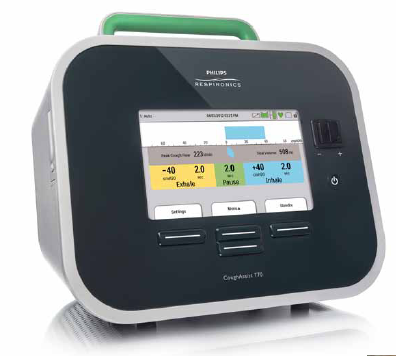 The Cough-Assist T70 is safe, simple and effective Mechanical Insufflation-Exsufflation Device. The Cough Assist Mechanical Insufflator-Exsufflator, or Cofflator, safely and effectively clears retained bronco-pulmonary secretions, reducing the risk of Respiratory complications. It comes standard with an adjustable internal inhale-flow restrictor, a simpler breathing circuit, and an optional mobile stand. The ability to cough is essential to a healthy airway. The airway linings produce mucus which trap dirt and bacteria. This mixture of mucus, dirt and bacteria can be harmful if allowed to accumulate. Coughing is the body's way of clearing mucus form the lungs and airways. Many respiratory diseases cripple the body's ability to cough by weakening the muscles in the rib cage, neck and abdomen. This weakened condition hampers the ability of your body to remove secretions, increasing the chance of respiratory infections. If coughing becomes to difficult for patients, doctors often prescribe the use of Mechanical Coughing Therapy. The Philips Cough Assist T70 is a mechanical insufflation-exsufflation device that simulates natural coughing by gradually delivering a large volume of air to your lungs. The process of breathing in constitutes positive pressure, followed by a negative pressure of quickly breathing out or coughing helps remove the mucus secretions trapped in your airways. 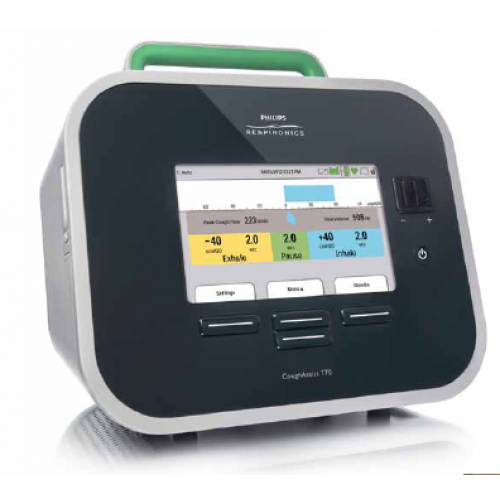 The Respironics Cough Assist T70 enhances your cough to produce a more effective clearing of your airways. The addition of the Cough-Trak allows you to synchronize treatment with your own breathing patterns. What conditions does the Device treat? Any patient unable to cough or clear secretions effectively due to reduced peak cough expiratory flow (less than 3 liters per second), resulting from high spinal cord injuries, neuromuscular deficits or severe fatigue associated with intrinsic lung disease is a candidate for the this device. How is the Cough Assist T70 used? The device is versatile enough to be used with a face mask or mouthpiece Additionally, it can work with an adapter to a patient's endotracheal or tracheostomy tube. It is also safe enough to be used on both adult and pediatric patients at home or in a hospital/institutional environment, and is a noninvasive respiratory therapy that safely removes secretions from patients suffering with an ineffective ability to cough. The device clears secretions by gradually applying a positive pressure to the airway, then rapidly shifting to negative pressure. The rapid shift in pressure produces a high expiratory flow, simulating a natural cough. Warranty: 1 year limited on T70, 90 days mask. Additional Note: MSRP with Full Local Support is $7,300, with Limited Support $6,999, or with Vitality Medical's Special Online Support $4,600. NOTICE: U.S. Federal Law restricts the sale of device to physicians or those with a valid prescription. My son has a script for cough assist but we have not been able to find a supply company that will sell it to us due to our insurance--- he has bluecross blueshield and medicaid as 2nd--- was told that they dont accept medicaid as a 2nd insurance- they will accept just medicaid/ bcbs with medicare as 2nd / or just bcbs ---do you know of a supply company that will sell with our insurance or do you deal with patients direct. We are unaware of any online retailer that accepts Medicare/Medicaid. If you're looking for reimbursement through Vitality Medical you'll have to contact them either before or after the purchase is made. 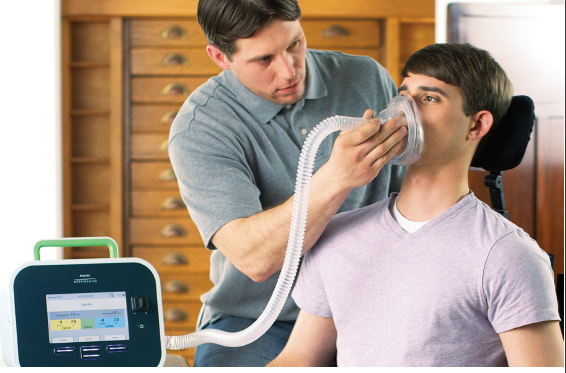 I purchased some Respironics Cough Assisst T70 by 3900$ each. Can I order one another with the same price? My husband is a C-3 spinal cord injury and this has been a life changer. He was lucky enough to be admitted right after the injury to a major spinal cord injury hospital who used the cough assist soon after the accident. Neither hospital in the town where we live has ever heard of this device so I had to bring in ours from home. After training the staff, they have purchased some to be used on the hospitalized patients. The old cough assist didn't have a battery and kept us home most of the time, suctioning alone does not do the job, nor does abdominal thrusts that used to be essential. We now have this new version with a battery. We are able to get out of the house a lot more now without the fear of him choking on a mucus plug or me breaking his ribs with a quad cough. I always use the cough assist when suctioning. 2.5 sec in, pause 2.5 sec, repeat 2 more times, then exhalation 2 sec, then suction. This has been a miracle sequence. I have ALS and difficulty getting the mucus from my chest and lungs. Since I began using the cough assist my lungs are totally clear, my blood oxygen has risen to an average of 96 without oxygen where before it was around 90. This product was first used in a hospital and most of the doctors and nurses were very skeptical when we took it out of the box. Once it was set up we turned it on and on the very first try I was able to easily cough up mucus. Within one day I was totally clear. The respiratory doctor ordered one for his clinic. An outstanding new product. Thank you so much. This cough aid gadget gave me relief. I've been diagnosed with multiple sclerosis. The illness turned my life upside down. Before I was a very active person but because of this, my movements have been limited. One painful thing for me is when I have dry cough or I have colds. In which cases I cannot really cough out normally because I can feel pain and there are times that I cannot move.With this device, I am now able to get all the phlegm out without me getting the painful feeling associated with my coughing. Thanks for this technology. It was great help for me while I was having lung inflammation. I had to cough like crazy and it was always painful before getting this. With this, though it doesn't stop coughing itself, you can do it more easily. I would highly recommend to buy it those who have bronchial disease quite often like me. The Cough Assist is a reliable, best and safe therapy. It removes the patient’s secretions slowly who are not able to cough on their own. The cough assist will gradually apply positive pressure to the airway and then it shifts quickly to negative pressure. This fast shift in the change of the pressure gives high expiratory flow resulting in natural cough. Thanks to Vitality Medical for high quality product at great price! !